Fans of The Voice are in for a treat. NBC just announced they’ve ordered a companion web series called Comeback Stage. 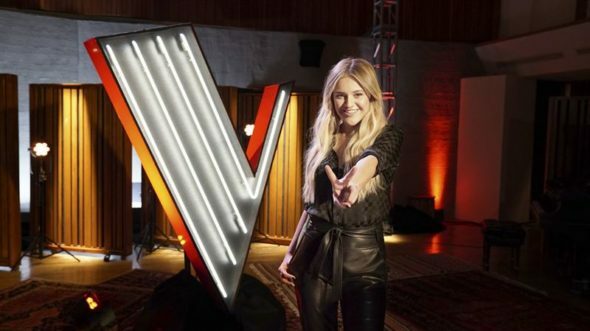 Hosted by Kelsea Ballerini, the competition show offers singers who auditioned for The Voice the chance to compete and re-enter during the live shows in November. Comeback Stage premieres on YouTube, NBC.com, Instagram TV, The Voice app, and Facebook on when The Voice returns to NBC on September 24th at 8 p.m. ET/PT. UNIVERSAL CITY, Calif. — Sept. 10, 2018 — Four-time Emmy Award-winning hit musical competition series “The Voice” will debut its first-ever, 10-part “Comeback Stage” companion series in its upcoming 15th season, which premieres Monday, Sept. 24 at 8 p.m. ET/PT on NBC. Chart-topping country music star and acclaimed singer, songwriter and performer Kelsea Ballerini will serve as the companion series’ “fifth coach” and mentor six deserving comeback artists who auditioned for coaches Kelly Clarkson, Jennifer Hudson, Adam Levine and Blake Shelton during the Blind Auditions but did not make a team. These six Comeback Artists will compete for a chance to re-enter “The Voice” competition and earn a spot in the Top 13 live shows in November. During the series, Grammy Award nominee Kelsea Ballerini will pair the six Comeback Artists into three Battle Pairings, coaching each artist on an individual song. These artists will go head to head in a Battle Round, and Ballerini will determine the winner of each Battle Round. Then, in the next phase of the series, the three Battle Round winners will move forward to the Comeback Stage Finals, each performing a final song in the series. Based on these performances, Ballerini will identify the final two artists who will move on to the final phase of the series and perform live for America’s vote. On the Live Playoffs Results show airing Tuesday, Nov. 13, the final two Comeback Artists will return to “The Voice” stage to perform for America’s votes in the first Twitter Instant Save of the season. The winning Comeback Artist will then decide which team they would like to join moving forward in the competition: Team Kelly, Team Jennifer, Team Adam or Team Blake. The “Comeback Stage” series will air on several platforms, including YouTube, The Voice Official App, IGTV (Instagram), Facebook and NBC.com. A sneak peak of each digital episode will be previewed in “The Voice” broadcast on Sept. 24-25, Oct. 1-2, Oct. 8-9, Oct. 15, Oct. 22, Oct. 29 and Nov. 5. What do you think? Do you watch The Voice? Will you check out Comeback Stage? If it’s put on TV I’d like to watch the Comeback Show. I will be watching for sure!! !